This is a powder toilet bowl cleaner that transforms into a raging foam when it contacts water. It has a strangely alluring scent, and gets the job done. The bottle said to use 1/3 capful and to use more next time if the foam didn’t “reach the rim”, but 1/3 capful wasn’t nearly enough for my bowl. Throw an entire capful in your toilet and let this stuff do the work for you. This entry was posted in Home and tagged Cleaners. Bookmark the permalink. What about doing a review on Ranch Dressings? My mother is quite a fan and there are several impersonators out there. Hi, Katherine. Since the review is 7 years old, it is very possible that they have discontinued the product. If you’re interested in an effective toilet cleaner, our new favorite is “The Works” available at Dollar General, Wal*Mart, and other places. 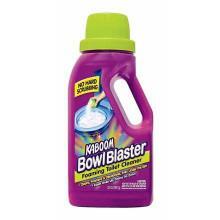 Very inexpensive, and VERY effective (even more so than Kaboom Bowl Blaster)!